We decided there was time for one more litter of Colorado Puppies this year! 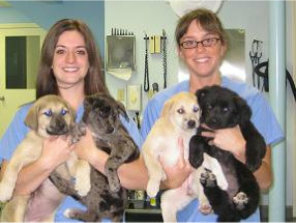 On October 01, 2008 the Newport Animal Hospital was once again home to puppies from the Valley Humane League. These puppies, like the last litter, were also shepherd/husky/lab mixes. Since Halloween was right around the corner, our staff gave these pups “spooky” names: Meet “Lizzie”, “Carrie”, “Boo” and “Edward”, and the loving families that gave them each a forever home. Lizzie, a striking Aussie/Lab mix, was named after Fall River’s most famous axe murder, Lizzie Borden. Fortunately, she is nothing like her namesake. 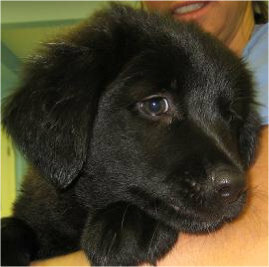 An extremely sweet and playful puppy, Lizzie was always up for a snuggle session. She was by far the staff favorite. Lizzie was the first of the puppies to leave us– she went to a nice family on the island who will spoil her as much as we did. As a member of the family is an electrician by trade, they cleverly re-named her “Joules”! Carrie, a Lab/Shepherd mix, was the smallest of the four. She didn’t let her size get in the way, though; Carrie could always hold her own at playtime! She was a very rambunctious and playful puppy, and could often be found wrestling with one of her siblings. Carrie would very often choose play over sleep! Now “Bella”, she was adopted by a nice family in Newport where she gets all the playtime she desires. I want to thank the entire staff at NAH for an absolutely amazing veterinary experience with our dogs CJ & Bentley! We hate to have to leave the area, and we wish that you could all come with us! Keep up the GREAT work! We are a full service companion animal hospital located in Middletown, Rhode Island, with veterinary clinics in both Newport, RI and Jamestown, RI. It is our commitment to provide quality veterinary care throughout the life of your pet.